Facial beauty has to do with much more than merely the color of your eyes and the fullness of your lips. The structure of your face—its basic framework—also affects your perceived attractiveness in your own eyes and in the eyes of others. Sometimes, when a person is bothered by the appearance of one facial feature, they do not realize that other features are also affecting their appearance. A perfect example is the nose and chin. Combining rhinoplasty with chin augmentation to enhance the profile of the face can greatly improve your overall aesthetic results and facial beauty. A major benefit of undergoing two procedures at once is that it can save you time and money. If you have met with your plastic surgeon and have already determined that you may need both rhinoplasty and a chin implant, it is smart to consider getting both procedures done at the same time. Doing so will save on anesthesia fees and other costs, and it will also save you from having to go through recovery for each procedure individually. A study in Italy revealed that combining chin augmentation with rhinoplasty leads to long-lasting results. Patients in this study who opted to have both chin augmentation and rhinoplasty maintained a stable facial profile when analyzed three years later, with no more than a millimeter change in the length of the chin. This is far longer than the results of fillers, which are temporary. While some experts may suggest using fillers to augment the chin or jaw, fillers are not a good solution for someone seeking long-lasting results. Chin augmentation inserts an implant that is permanently fixed to the chin, and the results can be as long lasting as the results of rhinoplasty. The facial profile is a significant factor in facial beauty. The angle and shape of the nose and chin as they relate to each other determine how aesthetically pleasing your profile is. In some people, the nose sticks out significantly farther than it should in relation to the chin. Individuals may look at this and think that rhinoplasty is the solution, but the chin may be just as much to blame. 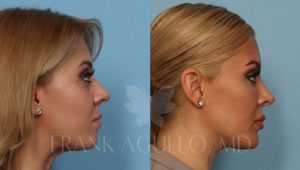 A patient who undergoes rhinoplasty to alter the nose but does not get a chin augmentation may later look in the mirror and feel that the face is still disproportionate. Combining these procedures improves both facial features and can lead to the best overall results. As rhinoplasty can refine the nose, chin augmentation can enhance the chin. The result is a balanced appearance with an aesthetically appealing profile. Rhinoplasty and chin augmentation can be combined to improve your face shape and enhance your appearance. To learn more about these procedures, schedule your consultation with one of our expert plastic surgeons at Southwest Plastic Surgery. Call (915) 590-7900 or complete our online contact form to reach us today. You can also visit our appointment form to book your appointment directly.